Soldak Entertainment is known for presenting their games with early access releases before giving the players a finished game. They’re taking the same route with Din’s Legacy. If you’re familiar with Soldak’s games, you may recognize this name. In 2012 they also released a game called Din’s Curse. Din’s Legacy continues on both this game and another game by Soldak named Zombasite. While the game would originally be released in the fourth quarter of 2018 with a launch in early access before that, we are getting the early access version now, near the end of 2018. During the Orc Schism, the entire Orc race was split into Dark Orcs, Zombielords, and the Mutated. The last category is what this game is all about. They’re tainted with Orc blood, a zombie parasite, and necromancer magic, making people mistrust and fear them. The Mutated slowly mutate further and further over time. Despite all of this, their behavior and psychics are actually more closely related to the Elves than to the bad guys. In order to prove they are actually good to the rest of the world, they have to fight in a tremendous uphill battle. The trickster God Din was intrigued by these mutations and their desire to prove themselves to the world. Since Din is always looking for champions, he decided to take a chance on the Mutated and made a pact with them. Each volunteer would become one of Din’s champions. He could send them wherever in order to try and save the world. In return, each time they die while being in his service, he resurrects them so they can continue battling. The developers of Soldak provided this game with an elaborate, yet not too lengthy story. The idea of your character not only developing in the usual way over time, but also mutating along the way, is a welcome and fun addition. This ensures constant creativity and keeps your character very interesting. Visually, Din’s Legacy isn’t up to date. It’s using older, outdated visuals. This may appeal to some players, but might also put off others. Nonetheless, the enemies and allies all have a good look. There is a bestiary available so you can keep up with what kind of monsters you met and what kinds you haven’t (these will be indicated by question marks). The enemies range from hell hounds, to Orcs, to different kinds of zombies and skeletons. They all have their own look but all share this evil, devilish appearance that really fits the atmosphere of the game. When looking at the in-game sounds, they come off as rather disappointing. Not a lot of interesting music is going on either. For example, you hear all kinds of birds chirping when you walk around and dramatic battling music starts when you enter fights. Yet, this battling music is interrupted constantly by your character making noises when you attack or are being attacked. You’ll go like ‘oeh’ every single time. We’re fighting off monsters here, not participating in a tennis match, right? Let’s take a closer look at the game itself now. Din’s Legacy is an action RPG where you play in a dynamic fantasy world. You start off by creating a character and choosing its basics like a name, gender and class. Next, you set up an area to play in. Here you can select at which level you want your monsters to start. This ranges from level 0 to level 100. You can also pick a difficulty setting, ranging from normal to ultimate, with three options in between. Furthermore, there are a few other options including the area size, the number of clans, whether or not zombies are allowed, etc. Din’s Legacy is also available in co-op multiplayer so you can enjoy hunting monsters (or more like them hunting you) with your friends. Obviously, the game gives you a lot of settings and options. This is definitely a good thing, since it allows you to personalize the game, making it appealing to more players. Now, throughout the game you will be aided by a help topic system. Every time you encounter a new element in the game, help on the topic will be shown. You just click the question mark on the bottom right if you want to learn about something. This is a very welcome addition since playing Din’s Legacy can be overwhelming at first because of all its features and possibilities. At the bottom of the screen you’ll also find ten spaces for hotkeys where you can put useful skills or consumables like health potions. As for the gameplay itself, a lot is going on. Your character changes over time since constant mutation is going on. As mentioned before, you start by choosing a class. However, mutation points you earn during the game allow you to mutate your character towards another subclass, introducing new skills. It’s up to you to create your perfect dream hybrid character! Besides these mutation points, you also have your main character points for your strength, intelligence, etc. You level up, obviously, by gaining XP points. These are obtained by killing monsters, but more importantly by completing quests. You can accept the ones you like and have a fixed number of quests you can accept at a time. Quests are organized according to their importance with P1 meaning the most important and P3 meaning the least important. Now, the game is still in early access, meaning changes are still being made. The biggest issue, being attacked immediately when you spawn in your main town, has already been fixed luckily. Even though a lot of issues and bugs have already been sorted out, some still remain. For example, when you enter a dungeon or some other place through a portal or gate, you will find it is swamped with monsters that immediately attack you. The developers should make an entrance in new areas more quietly or at least easier for lower level characters. It also feels like you have to click very accurately when attacking a monster. This sometimes gets much harder when a wall, a tree or some other environmental object blocks your view. Another remark concerns the vendors. The items you gather each have a certain value. However, vendors are not often seen meaning you have to carry around stuff for a longer time. Luckily, you have plenty of inventory space since you can collect bags easily. Besides this, the map looks kind of chaotic with all kinds of names above each other, not creating a clear overview. 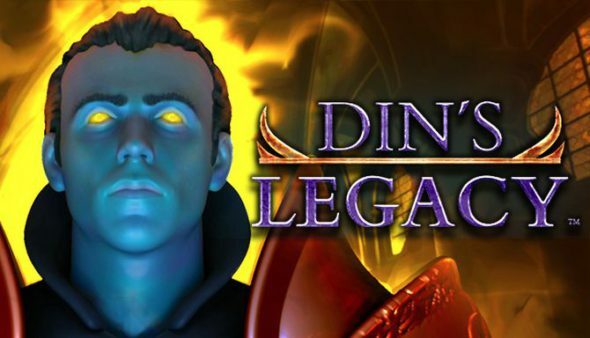 Din’s Legacy is still in early access but shows a lot of potential already. The gameplay is fun and often challenging. The mutating system brings interesting possibilities for your character and journey. However, being swamped immediately remains a big issue, along with some smaller issues like a chaotic map overview and environmental objects blocking your view. It feels like the music and in-game sounds aren’t really perfected yet either. However, Soldek Entertainment is used to working with user feedback in order to create better games, likely giving this game a bright future. With three patch rounds already executed, a lot of work will still be put in the game in the next six months or so. If you want to contribute to the making of this game by offering feedback, or want to enjoy the alpha version, you better get it now before it gradually starts getting more expensive.